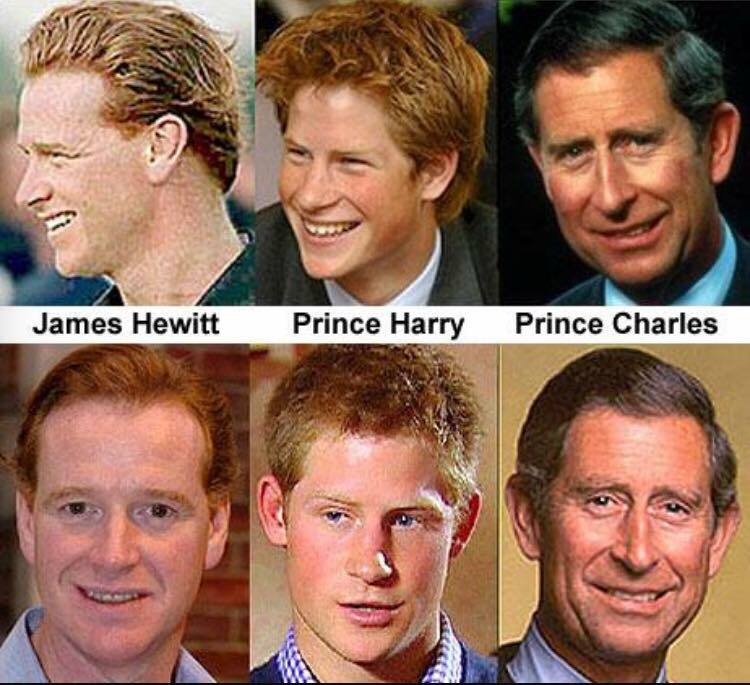 Ascension with Mother Earth and Current State of Affairs: PRINCE HARRY: ROYAL BLOOD – ROYAL NAZI? 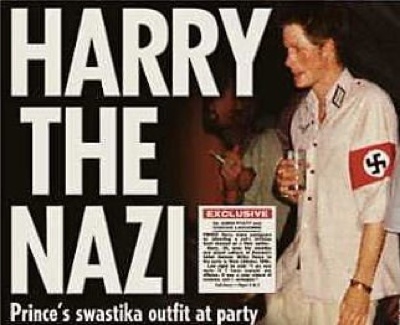 PRINCE HARRY: ROYAL BLOOD – ROYAL NAZI? British author CHRIS EVERARD reports on the close family ties between Buckingham Palace and the family which financed Hitler! PRINCE HARRY: One day he campaigns for wildlife protection and the next he is off killing buffalo in Argentina – on the estate of the family which funded HITLER! Who is Count Claudio Zichy-Thyssen? 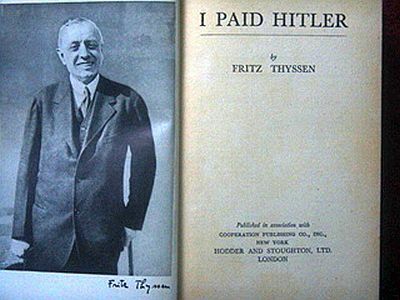 None other than the heir of Fritz Thyssen – the author of the book I PAID HITLER. Fritz Thyssen was the son of the successful industrialist, August Thyssen (1842-1926), and was born on the 9th November, 1873. He joined the German Army in 1896 and reached the rank of second lieutenant. In 1898, Thyssen joined Thyssen & Co a company owned by his father in the Ruhr. By the outbreak of the First World War the company employed 50,000 workers and produced 1,000,000 tons of steel and iron a year. At a meeting with General Eric Ludendorff in October 1923, Thyssen was advised to go and hear Adolf Hitler speak. He did this and was so impressed he began to finance the Nazi Party! Yep – you guessed it – the Thyssen family are the chums of PRINCE HARRY! Thyssen inherited his father’s fortune in 1926. He continued to expand and in 1928 formed United Steelworks, a company that controlled more that 75 per cent of Germany’s ore reserves and employed 200,000 people. By 1930, Thyssen was one of the leading backers of the Nazi Party. The following year he recruited Hjalmar Schacht to the cause and in November, 1932, the two men joined with other industrialists in signing the letter that urged Paul von Hindenburg to appoint Adolf Hitler as chancellor. This was successful and on 20th February, 1933, they arranged a meeting of the Association of German Industrialists that raised 3 million marks for the Nazi Party in the forthcoming election. Thyssen supported the measures that Hitler took against the left-wing political groups and trade unions. He also put pressure on Hitler to suppress the left of the Nazi Party that resulted in the Night of the Long Knives. Is this the kind of family that a British Royal should have dealings with? Obviously – yes! 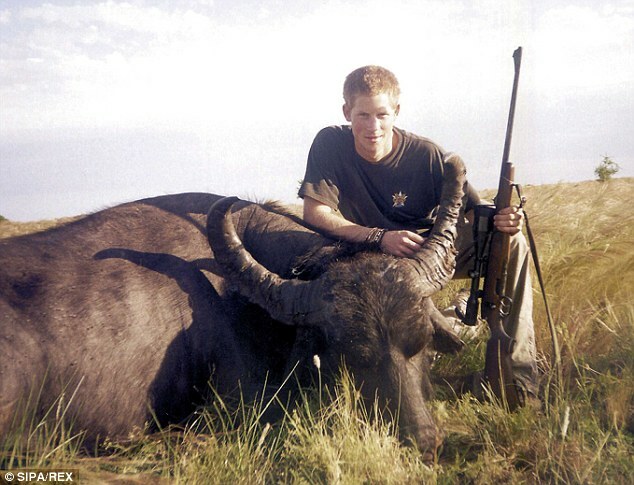 Just a few decades later – on the Thyssen estate – we see smiling Prince Harry crouching over the body of a one-ton water buffalo moments after he shot it dead on a hunting trip. This photograph has emerged less than a week after the young royal pledged to do all he could to save Africa’s critically endangered wildlife. Harry, who is also known to stalk stag, is likely to face similar attention following the publication of this picture, which has not been seen before in the UK. The prince spent several months working on the El Remanso polo farm in Argentina. During the trip, he and his then girlfriend Chelsy Davy joined an expedition to hunt big game, staying at a private lodge in the province of Entre Rios. “What the Allied investigators never understood was that they were not asking Thyssen the right question. Thyssen did not need any foreign bank accounts because his family secretly owned an entire chain of banks. He did not have to transfer his Nazi assets at the end of World War II, all he had to do was transfer the ownership documents – stocks, bonds, deeds and trusts–from his bank in Berlin through his bank in Holland to his American friends in New York City, Prescott Bush and Herbert Walker. Thyssen’s partners in crime were the father and father-in-law of a future President of the United States [my emph. WB]. “The British and American interrogators may have gravely underestimated Thyssen but they nonetheless knew they were being lied to. Their suspicions focused on one Dutch Bank in particular, the Bank voor Handel enScheepvaart, in Rotterdam. This bank did a lot of business with the Thyssens over the years. In 1923, as a favor to him, the Rotterdam bank loaned the money to build the very first Nazi party headquarters in Munich. “If the investigators realized that the US intelligence chief in postwar Germany, Allen Dulles, was also the Rotterdam bank’s lawyer, they might have asked some very interesting questions. They did not know that Thyssen was Dulles’ client [my emph. WB] as well. Nor did they ever realize that it was Allen Dulles’s other client, Baron Kurt Von Schroeder who was the Nazi trustee for the Thyssen companies which now claimed to be owned by the Dutch [my emph. WB]. The Rotterdam Bank was at the heart of Dulles’ cloaking scheme, and he guarded its secrets jealously. Now, today, in the 21st century, it seems that PRONCE HARRY is not only friends with the Thyssens – but he is one of their former employees!